The 2011 PBA Draft will already be on August 28, 2011 and it will happen at a new venue known as Robinsons Place Manila. Several interesting personas in the world of amateur basketball have applied for the Draft, such as Marcio Lassiter, Chris Lutz, Eric Salamat, Jason Ballesteros and other PBA aspirants. I'm sure that the PBA teams such as Powerade and Air 21 are already planning on who among the draftees will they draft. I heard that Powerade wants to get 2 Gilas players in the first round and then they want to get a big man in the 2nd round. To those who don't know, the Tigers are entitled to get 2 first round picks and 1 2nd round pick. They have all the luxury to get the best players in the draft. To give you a better idea on how your favorite team will fare in the upcoming draft, I have here a tentative top 10 PBA Draft order. The Powerade Tigers at number 1 and the Ginebra Gin Kings at number 9 are the only sure placings in this draft order. And so without further ado, here's the tentative PBA draft order. 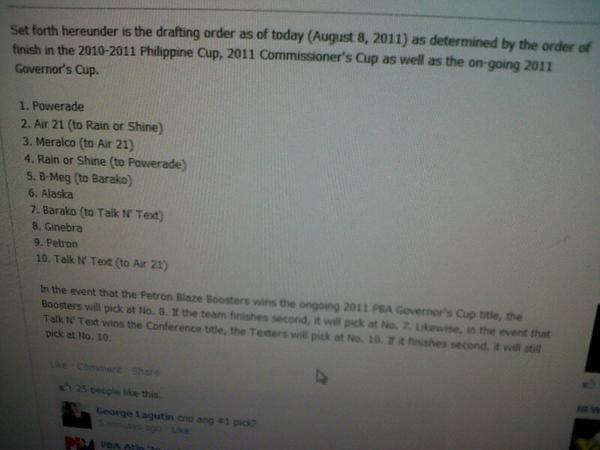 You might also want to check this PBA Draft Order. This is still subject to change depending on the result of the 2011 PBA Governors' Cup Finals. Do you have any know ledge pare kung bakit walang pick ang BMeg this upcoming season sa 1st rd. Tsaka kung saang trade nagyari yun. Dahil ba sa pagkuha kay Devance? Trading of picks for other players is more likely to occur or exchanging of draft picks in favor of player(s) the teams wants to make a revamp over this rookie draft. Another guessing games for other teams completing the puzzles or missing link. what the...huh? your damn post/comment is too fragmented it lost its point, if it did ever had one.